The Washington Redskins had a 2-1 record as they faced their traditional division rivals, the New York Giants, on October 28, 1945. 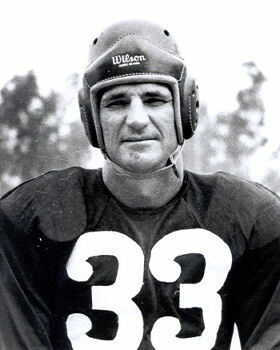 In their second year under Head Coach Dudley DeGroot, the team’s key player was still QB Sammy Baugh (pictured above), who was successfully completing the transition from single-wing tailback to T-formation quarterback. Other formidable weapons on offense were FB Frank Akins, HB Steve Bagarus, and end Joe Aguirre, who also handled the placekicking. The Giants, in their 15th year under Head Coach Steve Owen, had topped the Eastern Division in 1944 but had taken a much more significant hit in key personnel lost to the military in the offseason than had Washington. They came into the contest at 1-1-1. There was a sellout crowd of 55,461 on hand at the Polo Grounds. The Giants scored first when, five minutes into the game, they recovered a Baugh fumble at the Washington 33. After losing ground on a pass attempt, QB Marion Pugh threw for a 39-yard touchdown to end John Weiss, who outmaneuvered Baugh for the score. This was the high point of the contest for the Giants, as well as the nadir for Sammy Baugh. The Redskins were held on downs in their next possession, but tied the score on a second quarter drive in which Baugh threw to Bagarus for 21 yards, end Doug Turley for 17 more, and then HB Wilbur Moore for a 17-yard touchdown. Joe Aguirre’s successful extra point made it 7-7. Just before the half, the Redskins scored again on an Aguirre field goal from 37 yards. Washington kept up the momentum on the first series of the third quarter, taking the second half kickoff and driving to another TD. Moore started the possession off with a 27-yard run and Baugh completed a 26-yard throw to Bagarus along the way. Frank Akin plowed into the line for a three-yard touchdown to finish the drive. Penalties nullified two apparent Washington touchdowns later in the second half as the visitors completely dominated the Giants. Baugh, a fine safety on defense, intercepted a pass and returned it 69 yards to set up the final Washington score. It was Baugh passing to end Wayne Millner for a six-yard TD following the long return. New York took the ensuing kickoff and scored one last time in the last 30 seconds of the fourth quarter. The Redskins came away with a 24-14 win that was not as close as the tally implied. Washington was well ahead in total yards (413 to 237) and first downs (18 to 11). The Redskins not only were strong through the air but on the ground, outgaining the Giants in rushing yardage by 182 yards to 30. Each team turned the ball over twice. Aside from Sammy Baugh, with the two touchdown passes and long interception return, the top performer for Washington was Steve Bagarus, who caught 8 passes for 162 yards. The Redskins lost just one of their remaining games to finish atop the Eastern Division with an 8-2 record. 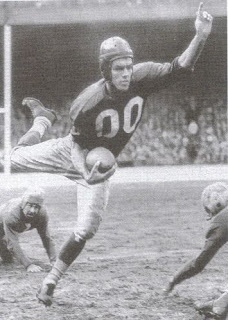 They lost a close-fought NFL Championship game by one point to the Cleveland Rams. New York dropped to 3-6-1, the franchise’s first losing record in nine years, to end up tied for third in the division with the Boston Yanks. Sammy Baugh, in his ninth season with the Redskins, set a league record that lasted until 1982 by completing 70.3 percent of his passes. He led the NFL in pass completions (128), ranked second in yards (1669), and third in touchdown passes (11). “Slingin’ Sammy” was intercepted just four times, thus also giving him the league’s lowest interception percentage among qualifiers (2.2). By today’s passer rating system he registered a 109.9 – a formidable rating by current standards, let alone those of the 1940s. Frank Akins ran the ball 147 times, more than any other NFL back, and ranked second in rushing with 797 yards (5.4 avg. per attempt). Steve Bagarus (pictured below) was third in pass receptions (34) and receiving yards (617), thus averaging 18.1 yards per catch.